ATLANTA (AP) Hawks coach Mike Budenholzer has been waiting for his young team to notch a signature home victory against a quality opponent. 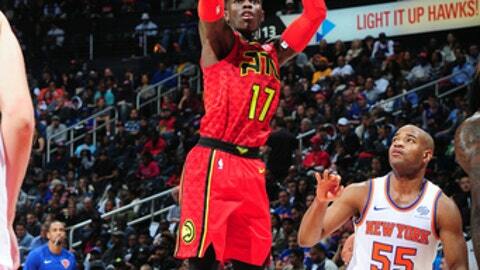 Dennis Schroder scored 26 points and the Hawks used a 30-point third quarter to snap a three-game losing streak and beat New York 116-104 on Friday night. The rebuilding Hawks, last in the Eastern Conference with a 4-15 record, earned just their second home win by outhustling New York with a 24-5 advantage in second-chance points. Kristaps Porzingis finished with 28 points and Courtney Lee added 26 for the Knicks, who led by 17 in the first quarter. New York’s bench was outscored 37-16 as Marco Belinelli had 15 points and Ersan Ilyasova scored 10 for Atlanta. The Knicks, falling to 1-5 on the road, never led after Ilyasova’s 3-pointer with 4:21 left in the third quarter. They were up by eight at halftime. Lee, in his highest-scoring game in two years with the Knicks, hit his first eight shots and finished 11 for 14 from the field, but he took just one shot in the fourth, a layup that made it 98-93. What started as bad execution in allowing 35 points in the second quarter became a total breakdown for New York’s defense in the third. Lee knows his team can’t afford to slack off defensively. New York struggled all night to contain Schroder, who easily weaved through the lane and around the baseline to keep the Hawks’ passing game fluid. The fourth-year point guard finished with eight assists, and often whipped the ball around to set up assists. Tim Hardaway Jr., in his first game back at Philips Arena since leaving Atlanta as a free agent last summer, scored 22 points. Dewayne Dedmon had 16 points and Taurean Prince and John Collins each scored 13 for the Hawks. Dedmon, at 7-foot is just three inches shorter than Porzingis, so the Atlanta center had no trouble getting physical inside. Porzingis got frustrated in the fourth, drawing a technical foul immediately after Bazemore fed Dedmon for a reverse layup that made it 102-95. Knicks: C Enes Kanter woke up with back spasms Friday and didn’t play. Kanter, who averages 13.6 points and a team-high 10.2 rebounds, had started in all 17 of New York’s games. Kyle O’Quinn started in Kanter’s spot and had two points and six rebounds in 23 minutes. … The Hawks showed a brief video tribute to Hardaway, who played the last two seasons with Atlanta, during a first-quarter timeout. Most of the resulting cheers came from several thousand Knicks fans in the building. Hawks: F Tyler Cavanaugh is proving worthy of extra minutes in a reserve role. The rookie from George Washington had eight points in 12 minutes. His putback against Willy Hernangomez put the Hawks up 93-89 in the fourth and then he added a left corner 3 to make it 98-89. Knicks: Visit Houston on Saturday. Hawks: Host Toronto on Saturday.